The sunshine is waiting for you when you land at Barcelona-El Prat Airport. However it’s not just sun, sea and sand in Barcelona – this is a city with so much more to offer, a place where lovers of art, food and architecture can find their own slice of heaven. 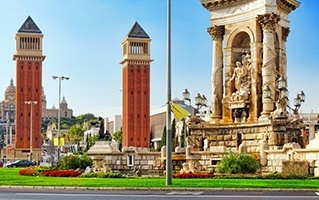 If you’re planning to head into the heart of Barcelona or take to the roads of Spain and see what other cities such as Tarragona and Zaragoza have to offer, car hire from Barcelona Airport is the perfect way to make the most of your trip. Our pick-up points within the airport are easy to find. In Terminal 1 we’re on level 0 in the A zone and in Terminal 2 you’ll find us right in the front of the terminal building, just follow the car rental signs. Choose the perfect car for your trip from our comprehensive collection of vehicles, whether you’re looking for a compact city car or a larger family model. We pride ourselves on offering an excellent level of service and will aim to get you into your car and out on the road as quickly and as conveniently as possible. When you land at Barcelona Airport you need to make a big decision, head to the capital or take a Spanish road trip to one of the other fantastic cities within easy reach of the airport. Barcelona Airport is just 15km away from the centre of Barcelona and though it’s known for the beach, the city is also world-renowned for its stunning architecture. You could easily fill your days exploring all the beautiful sights this city has to offer, including the Basilica of the Sagrada Familia, one of Barcelona’s most famous attractions. This incredible, unfinished church designed by Antoni Gaudi has a mesmerising exterior with ornate towers, along with an interior that has to be seen to be believed. Casa Batlló is another piece of legendary architecture and a UNESCO world heritage site in its own right. Of course you can’t talk about Barcelona without mentioning the array of incredible beaches on offer. Barceloneta Beach is the most popular and therefore most crowded beach within Barcelona – and when you look at the crystal blue ocean it’s easy to see why. You can enjoy a range of different water sports or just relax with a view of the sea in one of the many amazing seafront restaurants. For beaches that are a little quieter and more peaceful then drive on the AP-7 to Llança, in north Girona. This charming little Mediterranean town has some of the most beautiful beaches and natural coves in Spain. Visitors from all over the world fall in love with Barcelona – and it’s not just the architecture that charms them, as the city offers an incredible mix of food. If seafood is what you’re craving then consider booking a table at the traditional Botafumeiro. For true tapas, choose the local favourite of Bar Celta, a lively little eatery serving plates piled high with patatas bravas and chocos (fried cuttlefish). If a foodie adventure is on the menu then travel along the coast to Valencia, the home of paella. Casa Carmela is well known throughout the area for creating a fantastic version of this delicious traditional dish. When you arrive at Barcelona Airport there’s not just the capital to visit. There are a host of other must-see cities that you can explore on a Spanish road trip. Take the AP-7 to the city of Girona, stopping off at a couple of the charming towns you encounter along the way, or take the longer C-32 route to take in the views along the coast. Once you arrive in Girona you can spend hours wandering around the many museums and galleries in the city. Take the C-32 from Barcelona Airport to Tarragona and you’ll be treated to an architectural delight. In the town you’ll find a number of important Roman sites to explore, including a beautiful seaside amphitheatre which is one of Spain’s most important Roman discoveries. Car rental from Barcelona Airport puts the must-see sights of this incredible city within easy reach, as well as allowing you to head out to explore the wider region. There are a number of different routes you can take from Barcelona Airport to connect you not just to the capital but to all the other incredible cities across the country. The airport is just a 25-minute drive away from Barcelona city centre, so easily reached after you pick up your hire car. In Barcelona – as in the rest of Spain – you’ll be driving on the right-hand side of the road. Roundabouts run anti-clockwise and you need to give way to traffic approaching from the left. Watch out too for one-way systems, as there are quite a few around the city. Main roads usually have a limit of 90km/h, although on many access roads in and out of Barcelona this is set at 80km/h. Roads within the city have a limit of 50km/h. The Autopistas are the main highways and have an ‘A’ or ‘E’ in front of the road number. Those marked with an ‘A’ are usually toll roads, with speed limits for both set at 120km/h. Toll roads are known as ‘peages’, while Autovias are two-lane highways where limits are set at 80km/h and up. Roads in and around Barcelona are well maintained and give you access to some incredible Spanish scenery. Head out of the city and you’ll see the landscape change from imposing mountains to sunny coastal roads. For example, leave Barcelona Airport on the C-32 then join the AP-7 and in just over an hour you’ll arrive in Tarragona – a beautiful port city with a rich history and a number of sights to see.